Boston survivors Celeste Corcoran, left, and her daughter Sydney Corcoran, meet with Pulse survivor Angel Colon at the Orlando Regional Medical Center, who is also greeted by service dog Zealand and Boston survivor Dave Fortier, right, on June 25, 2016, in Orlando. An Orlando Regional Medical Center statement says 10 bombing survivors and their service dogs visited the Pulse patients on Saturday. Survivors of the 2013 Boston Marathon bombing visited some of the victims of the mass shooting in Orlando, NBC News reported. 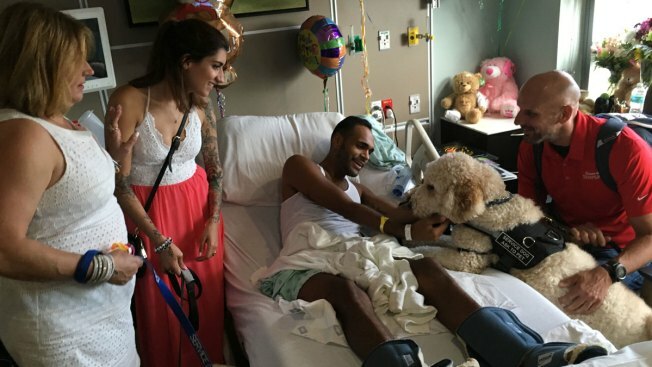 The ten marathon victims, along with service dogs, visited six of the Orlando nightclub shooting victims who were still in the hospital this weekend. The visit was set up by Orlando Mayor Buddy Dyer’s office. 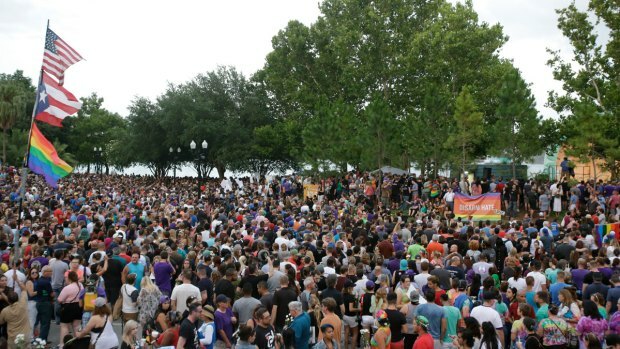 A large group was gathered together, with the help of JetBlue, Uber and AirBnB, according to marathon survivor Dave Fortier. "It's a lot of talking, learning about their families and where they are all from. We are able to relate on a scale some folks may not be able to do," Fortier told NBC News on Sunday, as he was still with one of the Pulse victims. "We are showing them some of the things we learned." The two groups shared their experiences and exchanged contact information.